A new microscope developed at the Howard Hughes Medical Institute's Janelia Research Campus is giving scientists a clearer, more comprehensive view of biological processes as they unfold in living animals. The microscope produces images of entire organisms, such as a zebrafish or fruit fly embryo, with enough resolution in all three dimensions that each cell appears as a distinct structure. What's more, it does so at speeds fast enough to watch cells move as a developing embryo takes shape and to monitor brain activity as it flashes through neuronal circuits. Nearly two years in development, Janelia group leader Philipp Keller says his team has built the first light microscope capable of imaging large, non-transparent specimens at sub-second temporal resolution and sub-cellular spatial resolution in all dimensions. Keller, and his team at Janelia aim to understand how a functioning nervous system emerges in an embryo. Over the last five years, they have devised several imaging technologies that make it possible to image large biological samples at high speed. His lab's newest microscope, called the IsoView light sheet microscope, overcomes a final challenge—improving spatial resolution—without sacrificing the performance features of his team's previous microscopes. The IsoView microscope is described in an article published online on October 26, 2015, in the journal Nature Methods. The publication includes complete building plans for the microscope and the associated image processing software developed by Keller's team. In 2012, Keller's team developed the SiMView microscope, which provides fast three-dimensional imaging of large specimens. His lab has used the technology to follow cells for days as they move and divide throughout entire living embryos, and to watch individual neurons fire throughout an entire central nervous system. Still, structures inside cells seemed blurred together, and cells deep inside a sample could not be seen well at all. "We had decent microscopes for the type of imaging that we do—rapid imaging of cellular dynamics in large, living specimens. The temporal resolution matched the timescales of the processes we're looking at, and we had microscopes that could give us good coverage and allow us to image for a long time without perturbing the system," Keller says. "But we hadn't really tried to push spatial resolution much in our microscopes to date." Scientists have found ways around this problem, and several new imaging technologies produce astonishingly detailed three-dimensional images. But none of those technologies combines high spatial resolution with the other features that Keller needed for his experiments. "We were trying to address this key problem in a way that does not cost us in any of the other categories that we care about. We need high resolution in all three dimensions without compromising coverage or speed." Rather than collecting a single image of a sample with a single objective, the new microscope simultaneously collects light and creates images from multiple angles. Each image still suffers from poor resolution along one axis, but the most useful data from each image can be combined to generate a final image with good resolution in all dimensions. Keller and a postdoctoral researcher in his lab, Raghav Chhetri, designed a microscope with four objective lenses positioned around the sample at right angles to one another, like traffic lights at an intersection. Each objective sends light into the sample to illuminate it, and also collects fluorescent light emitted by the sample. From each side, an objective produces a thin beam of light that sweeps the sample from top to bottom so quickly that the detection camera across from it sees a continuous sheet of light. The beams from each of the four objectives are staggered so that they do not interfere or intersect with one another, and a rolling shutter in each camera keeps pace with the beam, so that the camera's detector remains focused on the narrow slit along which it can pick up high-resolution information. These features allow the microscope to collect four different images of the sample from different angles simultaneously, without any crosstalk between these multiple views. Chhetri says the design seemed straightforward—until he looked for the parts he needed to build it. To maintain the imaging speed, coverage, and resolution the team wanted, the microscope's four objectives needed to fit closely together with just enough room to move during imaging, but be big enough to image large fields of view with good spatial resolution. No commercially available objectives met these needs. Compromising on any of their parameters was not an option, Keller says. "We're not just into proof-of-principle demonstrations. If we build such a microscope, we should be able to put it to good use in studying developmental and functional processes." "With all these stringent criteria, we decided we needed a custom design," Chhetri says. So the team designed the precise parts it needed and waited about 9 months for them to be custom built. Once the parts were in, Chhetri says, he knew the IsoView was going to work. The final step was developing a computational framework to take full advantage of the data collected by the IsoView. Each of the four cameras in the microscope collects data for an image that, by itself, still lacks good spatial resolution in one dimension. "We don't have a high-resolution image coming right out of the microscope," Keller explains. "It's still these four relatively low-quality images." Computer scientist Fernando Amat developed image-processing software to transform those images into a final high-resolution image. Keller notes that there was no software available that could do the job - it required developing an entirely new software package that could speed image-processing strategies by more than 60-fold. A typical experiment with this microscope might run for one hour. During that time, the four sCMOS cameras in the microscope can stream data from the experiment at rates up to 3.2 gigabytes per second. This results in about 10 terabytes of multi-view image data from one hour of imaging. With the new algorithms, an IsoView dataset can be processed in about two days with a single workstation. "Once we've registered and deconvolved the images, we get a very crisp version of the data," Keller says. "You can look at the image stack from any direction, and you don't have any perceived difference in resolution or crispness of the image." 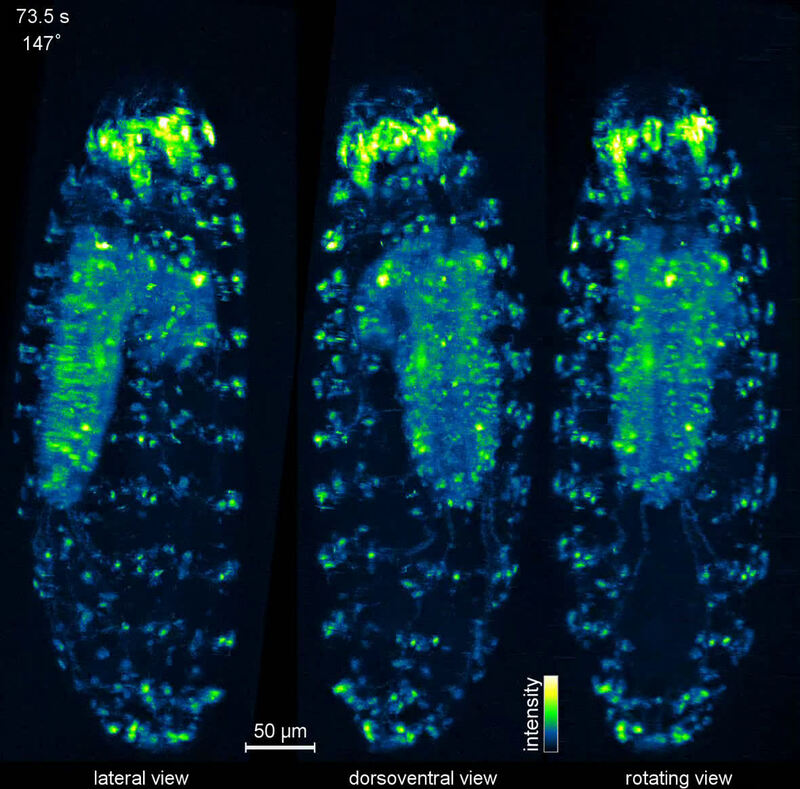 Keller and his colleagues have used the IsoView to visualize cell-by-cell activity throughout the nervous system of an entire living fruit fly larvae, an organism that has more than 10,000 neurons and is about 50 times larger than the roundworm C. elegans, the only animal whose complete nervous system has previously been imaged at the single-cell level. 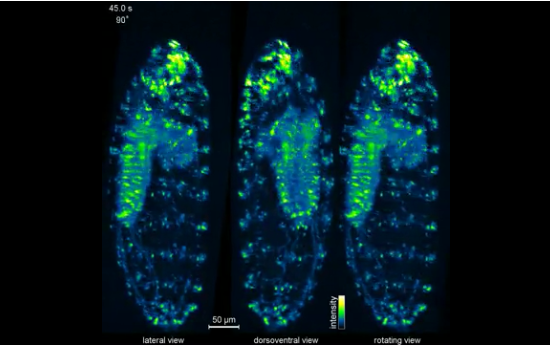 Because the IsoView can produce images as the larvae moves freely in a loose gel, Keller says, "this opens up the possibility of functional imaging in an entire, behaving animal. It is even possible to perform high-speed functional imaging over developmental time scales, as we demonstrated in imaging a fruit fly embryo developing into a larva." The scientists also performed high-resolution functional imaging of activity in the entire brain of a larval zebrafish, demonstrating that neurons in the deepest, least accessible regions of the brain could be seen clearly, separate from their neighbors. Finally, they used the IsoView to track cells in a developing fruit fly embryo. A multicolor imaging mode enhanced the information presented in the resulting videos by detecting different fluorescent labels on cells' membranes and nuclei. The team plans to continue improving the IsoView technology, but Keller is also eager to begin using it for biological experiments. "Right now it's our most advanced microscope for imaging, and we are certainly going to take advantage of it," he says.